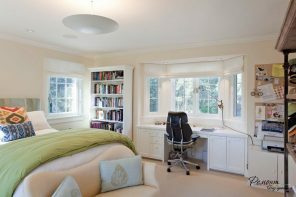 It is no secret that many people live in apartments with a very small area. 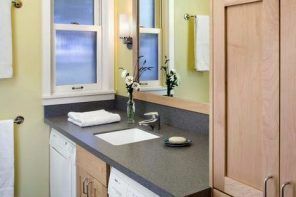 In particular, for bathrooms there is also a small space. This is more than understandable. By reducing the size of bathrooms, designers increase the living space of apartments. 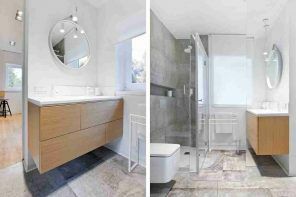 On the one hand, a small bathroom is a disadvantage, because even the most skillful designers can not make a small room big. 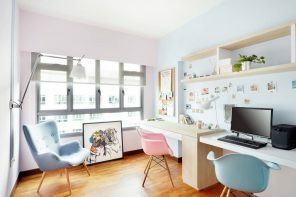 On the other hand, with the right arrangement, even a small bathroom will become a functional and convenient room, a great place to get a charge of cheerfulness in the morning and for relaxation in the evening. And the secret is that bathroom does not require much space in order to realize most effective washing machine in small bathroom placement ideas. How to Make the Bathroom Comfortable and Practical? It is necessary that at least a bath (or shower), a toilet, a washbasin fit into a small room. As a maximum (except for the already named) if it can accommodate a washing machine, a laundry basket, a locker for small items, etc. Placing a washing machine in a small bathroom is a particular problem. The standard machine has quite impressive dimensions. Nevertheless, this problem can be solved. 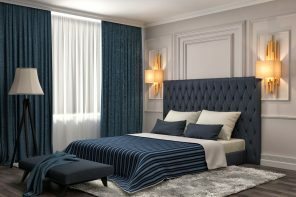 How to design the right design? Place the washing machine under the sink. In the houses of the old model, the design does not provide the installation of a washing machine. For this reason, residents are forced to show real miracles of ingenuity. It is convenient to place washing machines under the flat sinks. However, in this case, the sink may be placed excessively high. In the case when sink is too high, a good option is to raise the floor (except for the place where the machine is installed) by 5-7 centimeters. Thus the sink will be convenient to use, and the washing machine will not clutter the space. Put the washing machine next to the vanity. 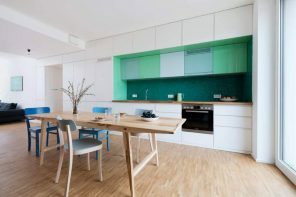 For harmonious look, it is better to combine them with one counter top. 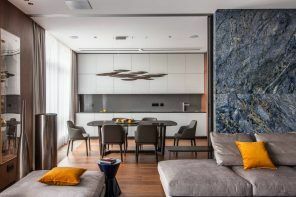 In order to visually expand the space correctly, a large mirror should be hung over the countertop. 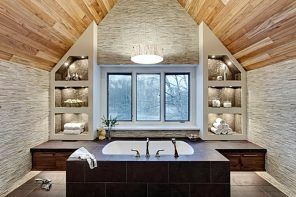 If the bathroom has a niche, then this space should be used to the maximum. For example, put a washing machine in it and use the rest of the space to store trifles. In addition, you can increase the free space in the bathroom to fit a washing machine. For example, install a shower cabin instead of a bathtub. Often the bath takes half the area of the bathroom and the smallest size of the shower is 80×80 centimeters. 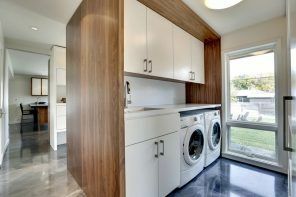 On the vacant space, you can put a washing machine, lockers, laundry basket, etc. Let’s consider in detail the first variant with the installation of the machine under the sink. It should be said that this is an extreme case of expansion of space and it should be used only if there no other options for installing the machine in the bathroom. Acquire a special-form sink – a water lily. Its dimensions should be at least 60×60 cm. Pick up the machine of the size that precisely fit under the sink. Often washing machines and sinks are sold in one set. In this case, the purchase will be much cheaper than if you buy a sink and a machine separately. In addition, it is very important to choose the right washing machine. In our time, there are household appliances are designed especially for apartments of small dimensions. There are not many of such models, but if you want, you can find everything. Do not buy a narrow washing machine with top or front loading. Nobody argues that such a machine will leave a lot of free space, but to load linen in it, choose the correct mode and turn it on will be very difficult. When placing the machine under the sink it is very important that the washbasin sewage does not get to the machine. In this case, even if there is an emergency situation and the sink is completely filled with water, the washing machine will not suffer. If the sink is located at a height of, let’s say, 80 cm, you should look at miniature machines, from 67 to 72 cm. Such devices do not wash many clothes at a time, about 3 kg, but the number of revolutions in the spin mode gives it the opportunity to squeeze clean things almost dry. In other words, small machine does not have such a high performance (it is not suitable for a large family), but it has many advantages. In particular, its small size. Such important devices as a valve that controls the consumption of powder and weighers for laundry and detergent can be installed in addition to the washing machine under the sink. It is important to note that small machine models wash no worse than machines of standard sizes. In addition, it is not necessary to place a washing machine in the bathroom. 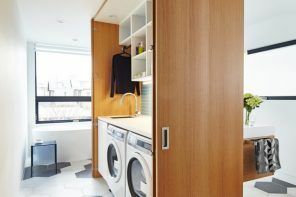 Especially resourceful owners of small apartments cut a special niche for this appliance between the bathroom and the toilet, or even carry it to the hallway and hide in the closet. However, when choosing the latter method of storing the washing machine, you should pay special attention. After each wash, just in case, shut off the water supply and open the doors to let it dry completely. Excess moisture in the closet will lead to nothing good. In conclusion, we say that the process of washing in machines of small dimensions occurs in the same way as in large ones. You need to load things into the drum, pour in the detergent, select the program for washing and press the button. Small machine will do itself all the rest. The efficiency of small-sized washing machines is divided in the same way as for large-sized washing machines, from A to G. Obviously, A are the most effective washing machines. In addition, the effectiveness depends on the person who uses the machine, on the cleaning agent and on the chosen mode. Only practice can help in this. Prices for washing machines depend on their technical characteristics, not size. That is, small sizes do not always indicate a small price. Often, smaller ones are even more expensive than standard machines.